It was 65 years ago, March 5, 1946, when Winston Churchill delivered his “Iron Curtain” speech in Fulton, Missouri. It was a speech that rocked the world and changed history. Churchill and his work, however, were hardly finished. He had been called upon to save Western civilization at the start of the decade, when Hitler’s Germany was at the gates. Now, he saw new vandals, equally dangerous, already inside the gates, and colored red. Stalin was their dictator. Worse, the West, complacent and tired of war, had no clue of the threat; it could not see the wolf at the door. The former prime minister travelled to America to issue a wake-up call to the free world. Nobody knows what Soviet Russia and its Communist international organization intends to do in the immediate future, or what are the limits, if any, to their expansive and proselytizing tendencies…. From Stettin in the Baltic to Trieste in the Adriatic, an iron curtain has descended across the continent. Behind that line lie all the capitals of the ancient states of central and eastern Europe. Warsaw, Berlin, Prague, Vienna, Budapest, Belgrade, Bucharest, Sofia, all these famous cities and the populations around them lie in the Soviet sphere and all are subject, in one form or another, not only to Soviet influence but to a very high and increasing measure of control from Moscow. Churchill conceded these were tough words to hear on the “morrow of a great victory” over Nazism , one where Stalin’s Russia had been an ally. Nonetheless, we could not be blind to reality, and simply wish away the dangers. Of course, Churchill was exactly right, as anyone paying attention should have noticed. A month earlier, Stalin had delivered his Bolshoi Theater speech, which followed blatant Soviet violations of the Yalta agreement signed a year earlier. Moscow was installing puppet governments and refusing promises of free elections throughout Eastern Europe, all the while committing countless war crimes, especially in eastern Germany, where Red Army soldiers committed two million rapes. The former prime minister spoke the truth. Churchill expected Stalin’s reaction. He also would not have been surprised to learn that members of Communist Party USA had gathered at Fourth Avenue in New York to prepare a P.R. strategy to smear his plans to launch “a new world war.” The international communist movement wasted little time. President Truman was stunned by the outrage among the liberal/progressive left . He had read the speech ahead of time, and seemed fine with it. Nonetheless, once confronted by angry reporters, Truman distanced himself from the former prime minister. According to historian James Humes, Churchill was so troubled by Truman’s disappointment that he did not recover until he found a friendly smile (and a drink) at the Gettysburg home of World War II pal Dwight Eisenhower. 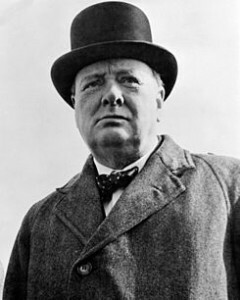 Journalist David Brinkley, who covered the speech, recalled that his fellow press people were appalled; they thought Churchill had lost his mind. Of course, we know the rest of the story. In the next few years, the Soviets blockaded Berlin, sponsored a coup in Czechoslovakia, and swallowed up Eastern Europe. According to the seminal work by Harvard University Press, The Black Book of Communism, at least 100 million people were killed by communist governments—a conservative figure that, even then, is double the combined deaths of World War I and II. Soviet authorities like Alexander Yakovlev maintain that Stalin alone was responsible for 60-70 million deaths.